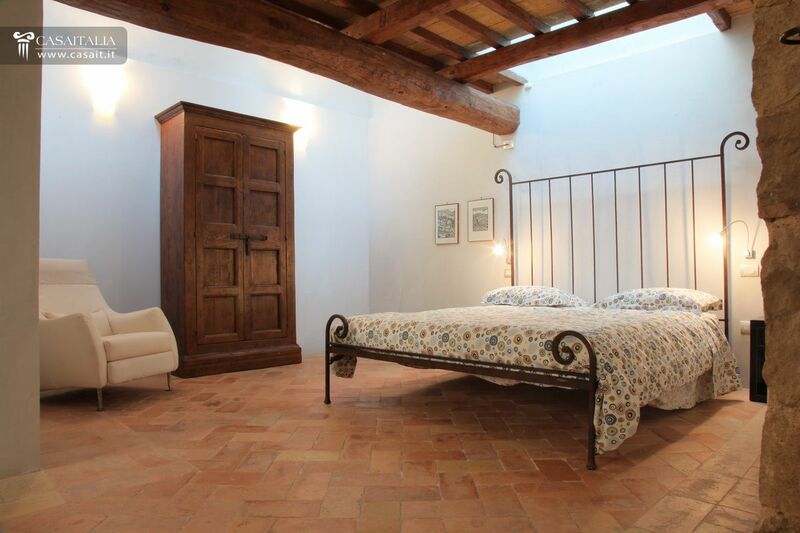 Two adjacent houses of 421 and 412 sq.m, fully restored, each with 4 bedrooms and 5 bathrooms as well as living areas. 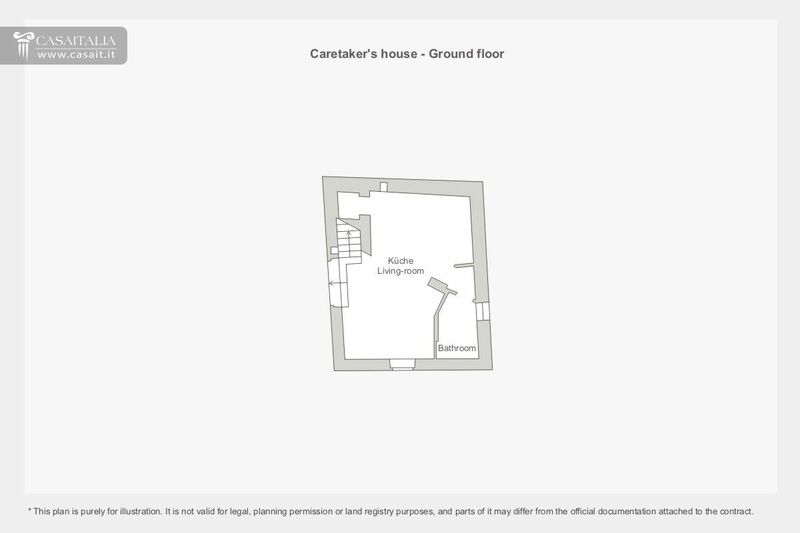 With separate caretaker's lodge and a small tower in need of restoration. 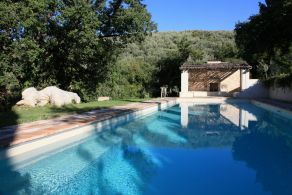 Surrounded by around 1.7 hectares of private land with swimming pool, woodland and olive grove. 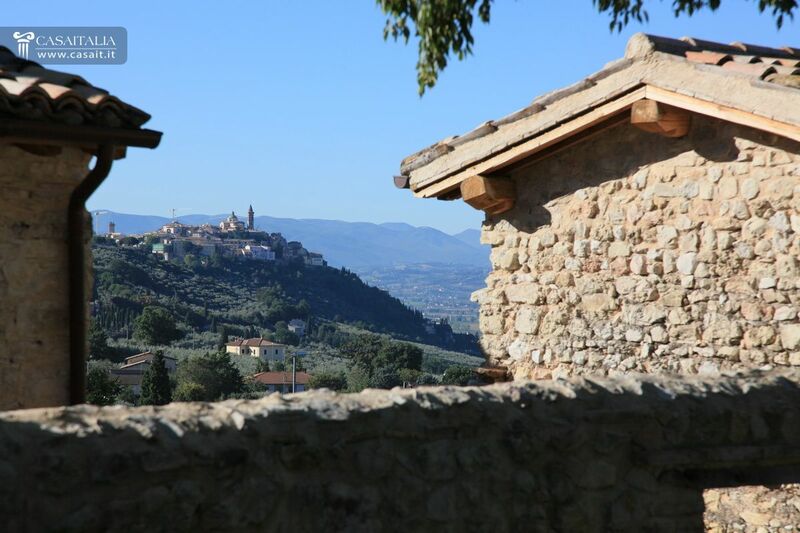 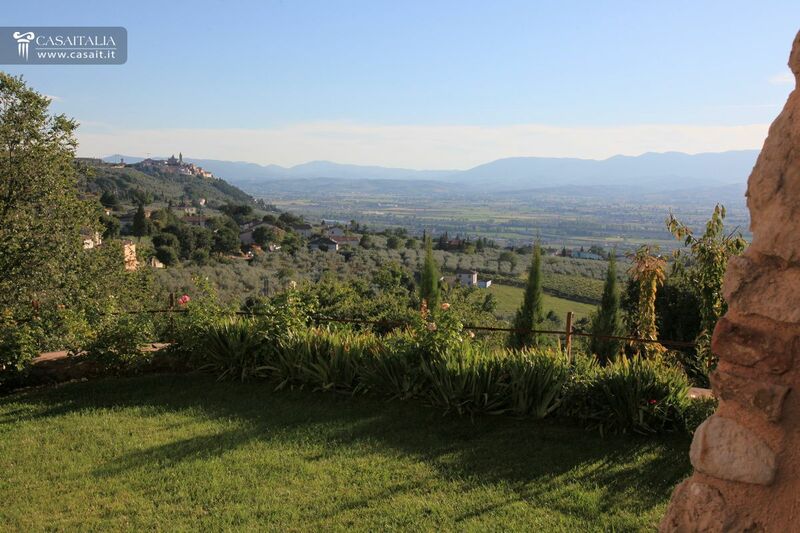 Panoramic views of Trevi and across the valley. 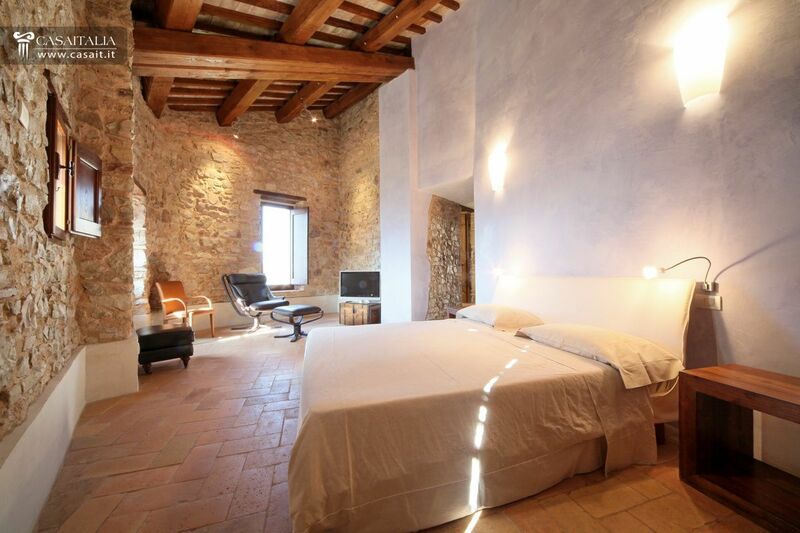 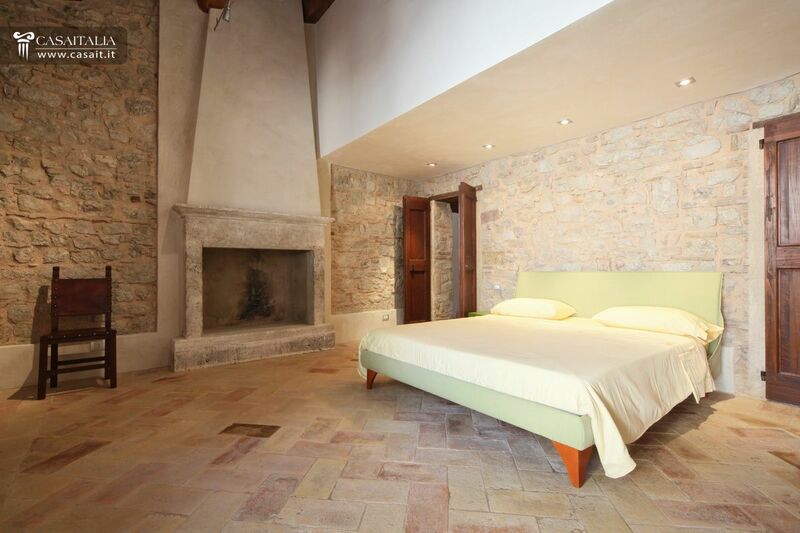 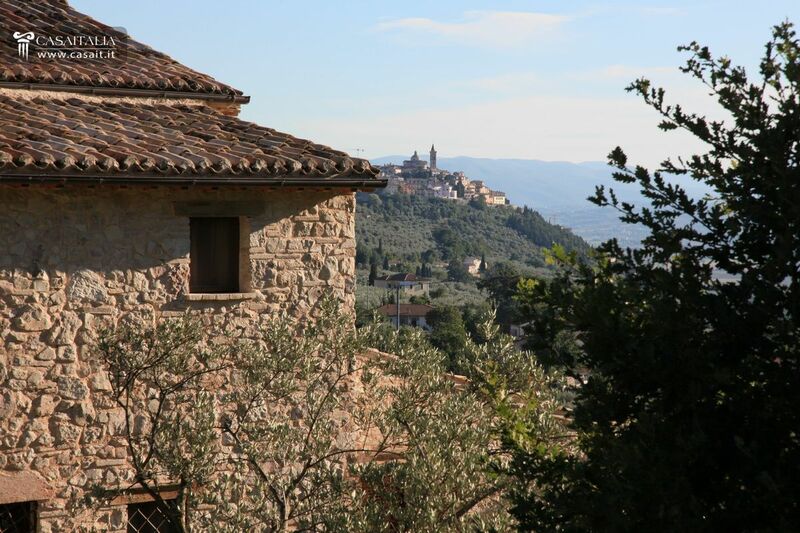 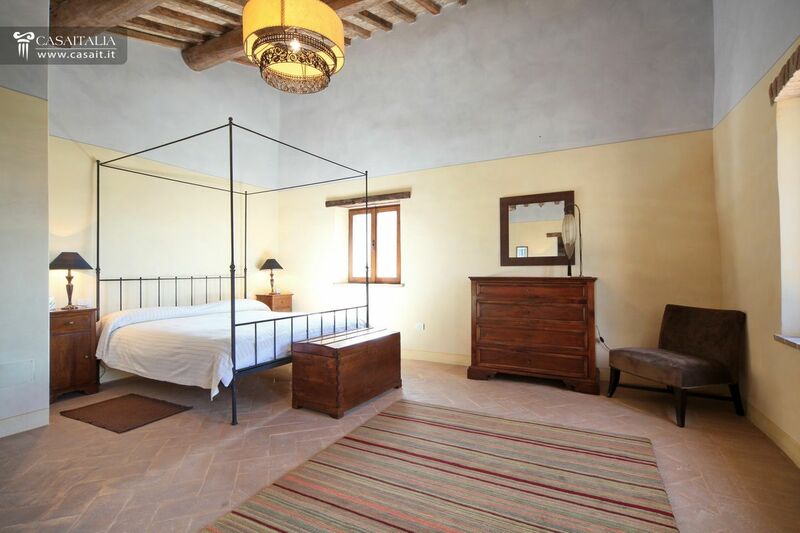 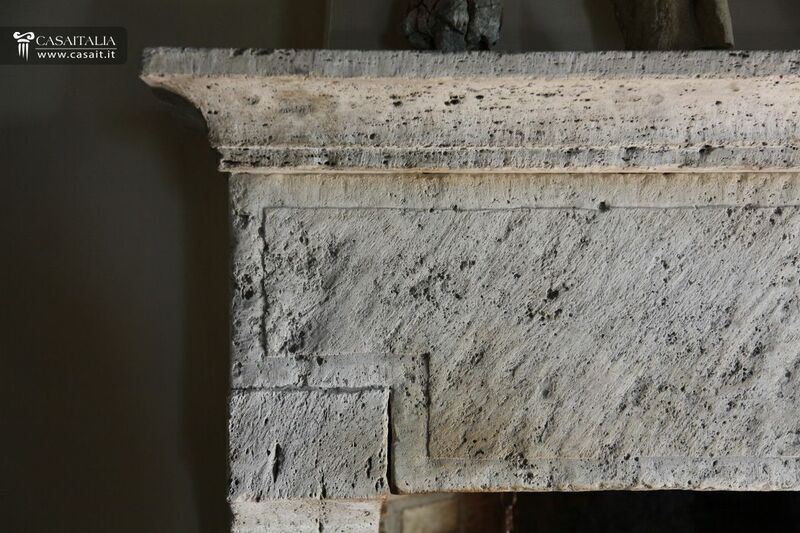 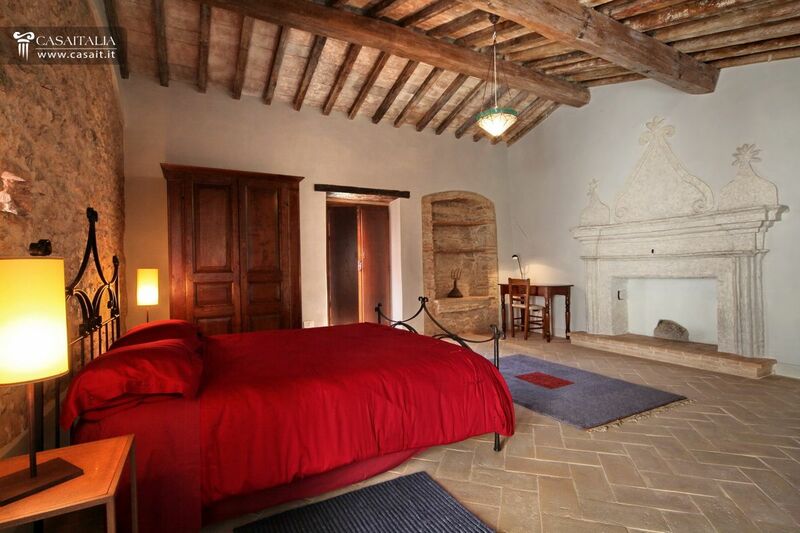 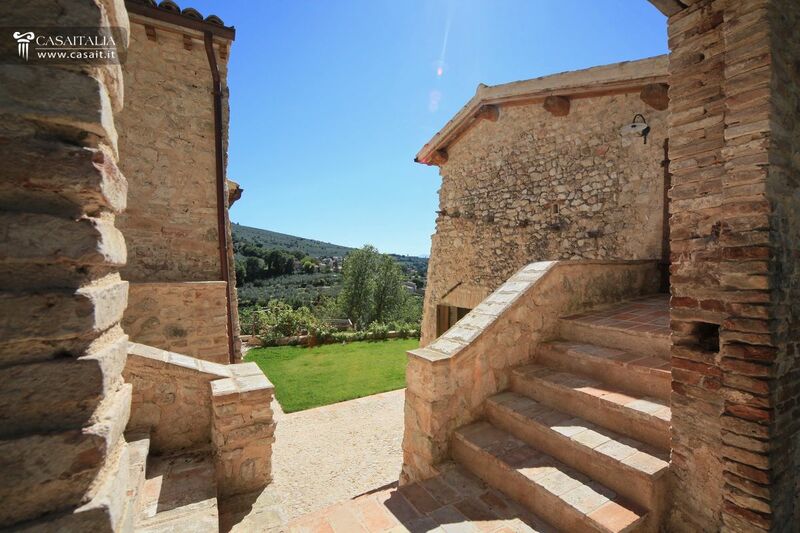 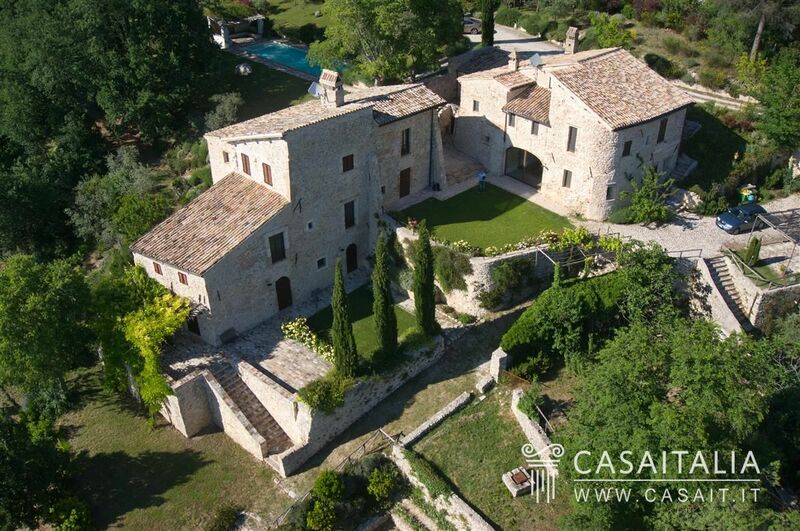 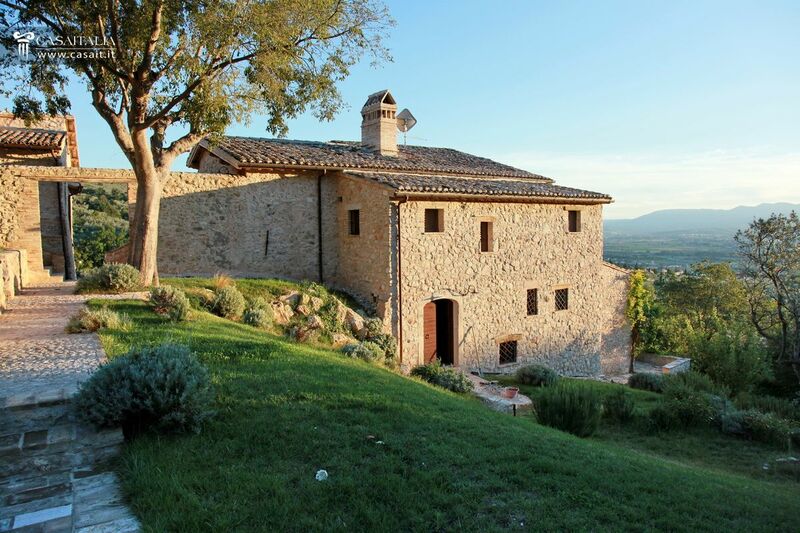 The property is set in a panoramic position with a magnificent view over Trevi and the Spoleto valley and comprises one farmhouse of 421 sq.m in total, a second farmhouse of 412 sq.m in total, a caretaker's lodge of 93 sq.m in total and a tower of 94 sq.m which requires restoration. 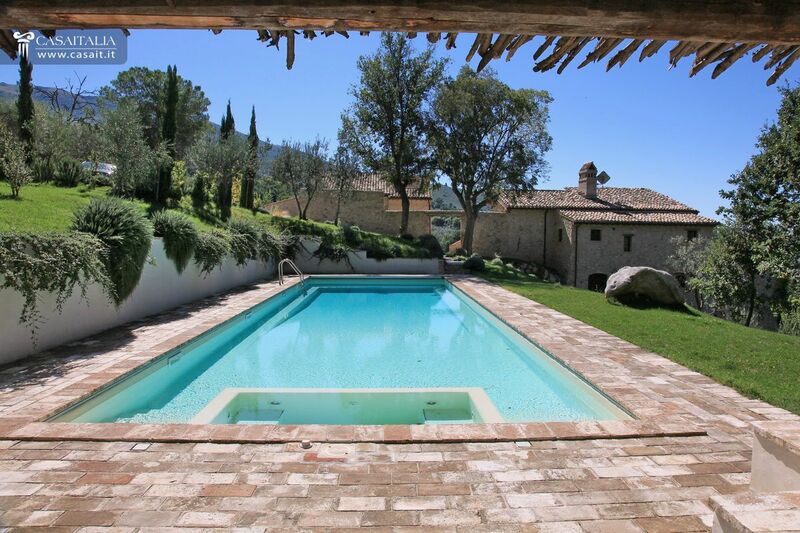 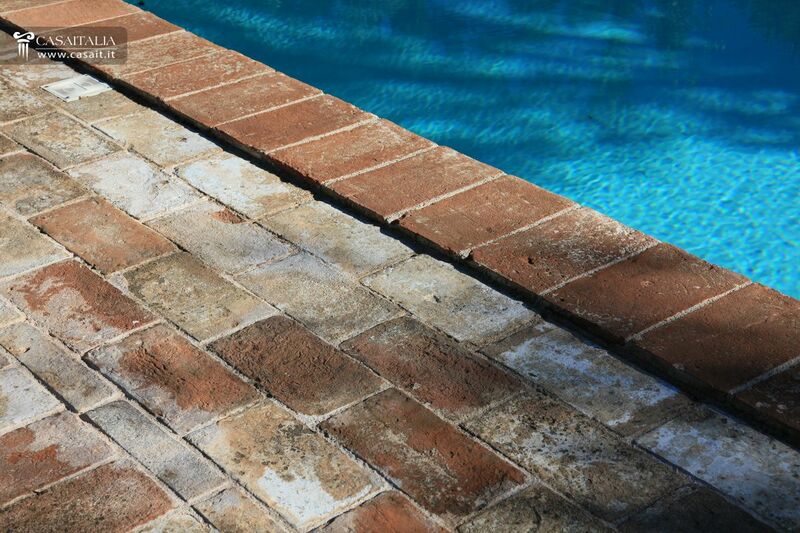 Surrounded by around 1.7 hectares of land with swimming pool. 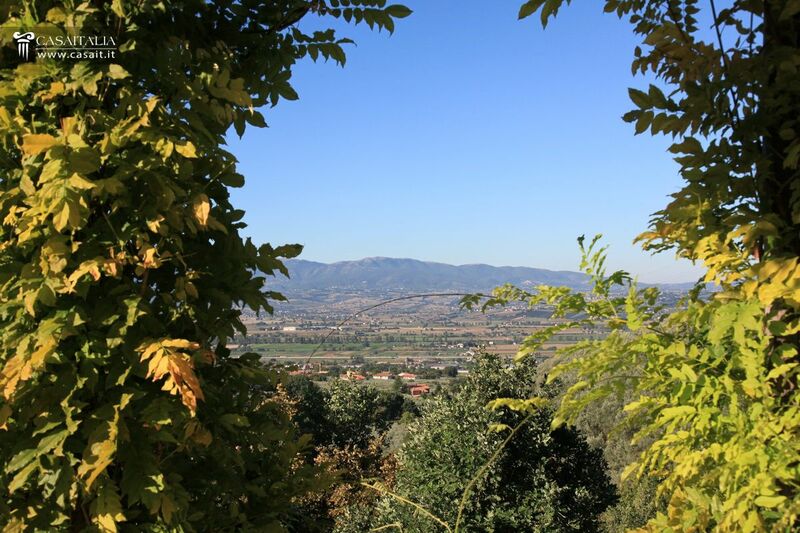 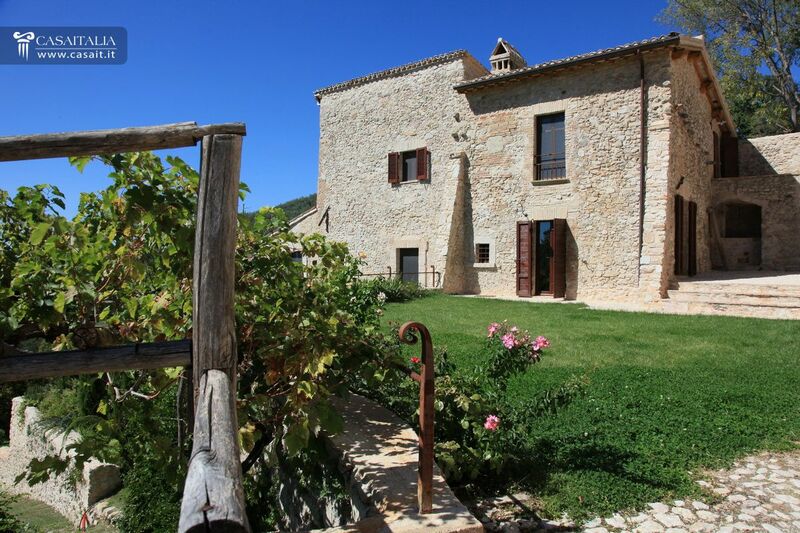 The property is only 3km from Trevi, one of the quirkiest villages in Umbria, surrounded by hills rich in olive trees which produce a renowned DOP oil. 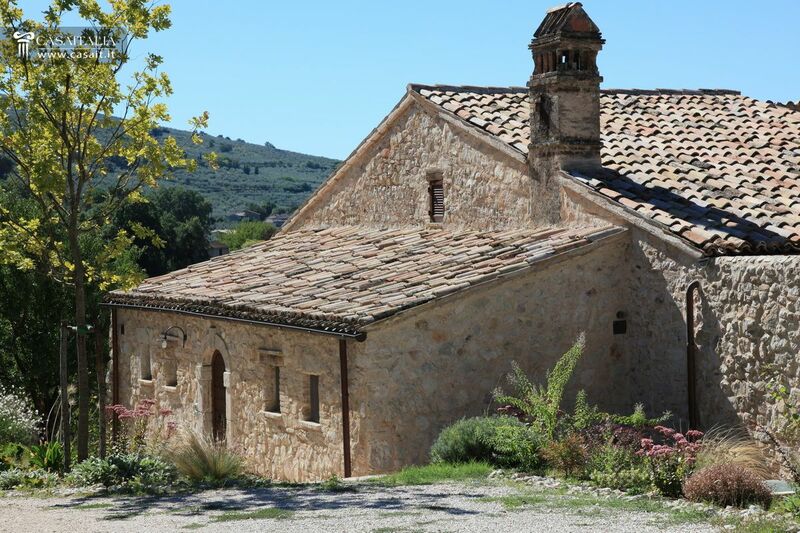 The location is secluded but convenient and central in relation to the other important Umbrian historic centres like Foligno (8km), Spoleto (24km), Spello (16km), Assisi (28km) and Perugia (43km), all quickly accessible thanks to the motorway which is only 3km away. 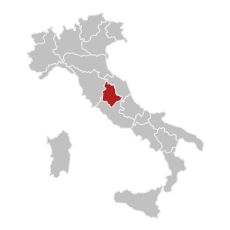 Perugia S. Egidio airport is half an hour away by car (38km); while Rome Ciampino (166km) and Rome Fiumicino (184km) can be reached in less than 2 hours. 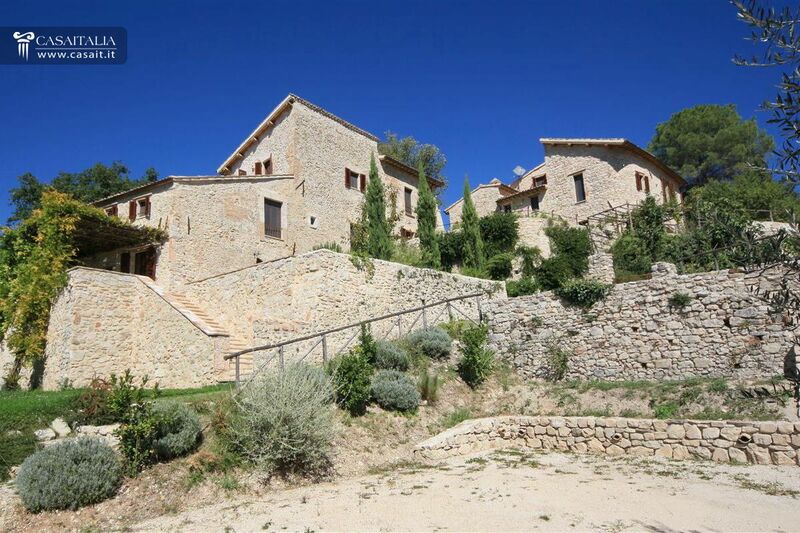 The two houses, fully restored, are adjacent but completely detached and the construction follows the traditional style of the hill towns of the area. 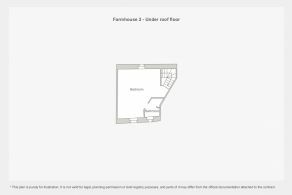 The house has a surface area of 421 sq.m across 3 levels. 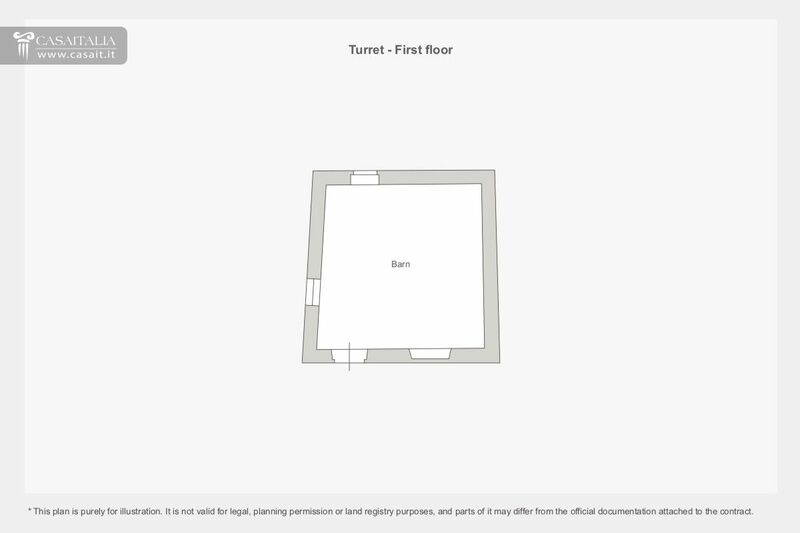 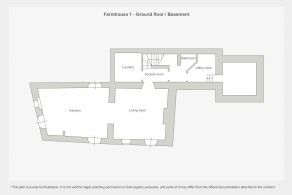 On the ground floor/basement there is a dining kitchen and living room on the lower level with windows opening out onto the garden and on the upper level there is a laundry room, cellar and storeroom. 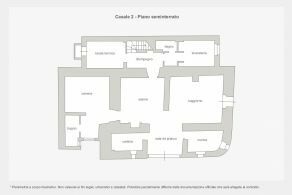 The first floor, accessible by an internal staircase with an entrance direct from outside, comprises a large bedroom of over 30 sq.m, another bedroom with en-suite bathroom, studio (convertible into a bedroom), home cinema and bathroom. 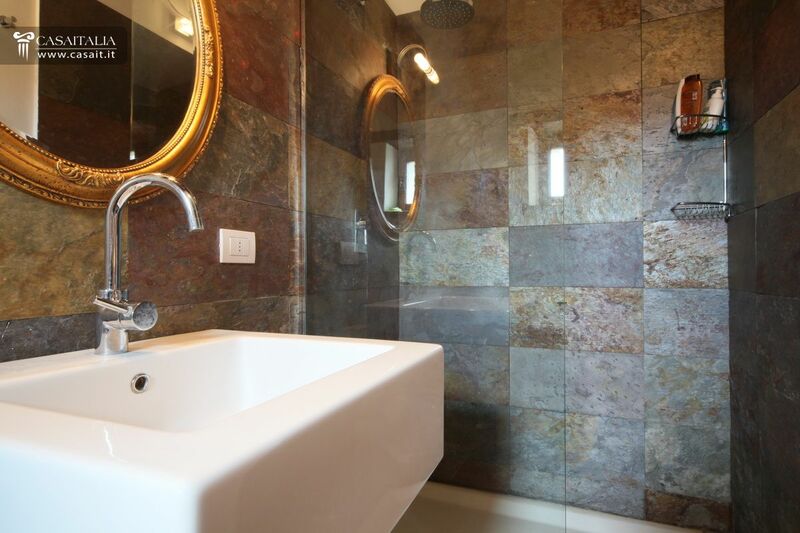 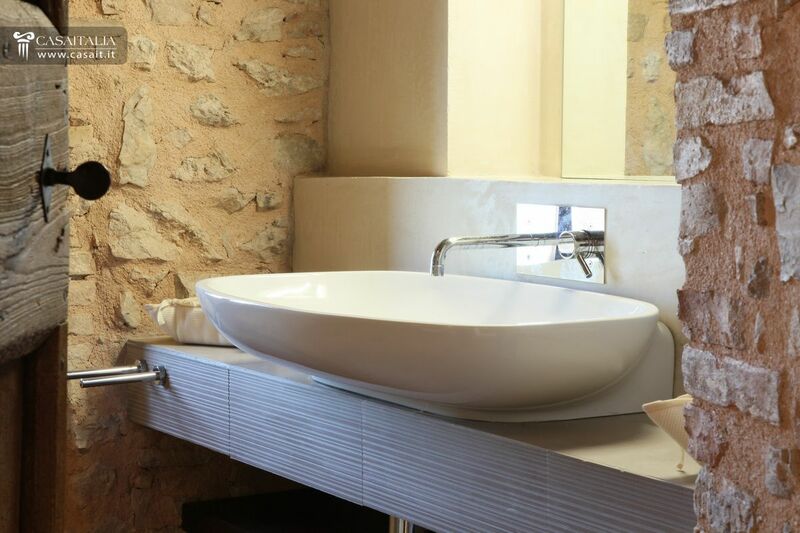 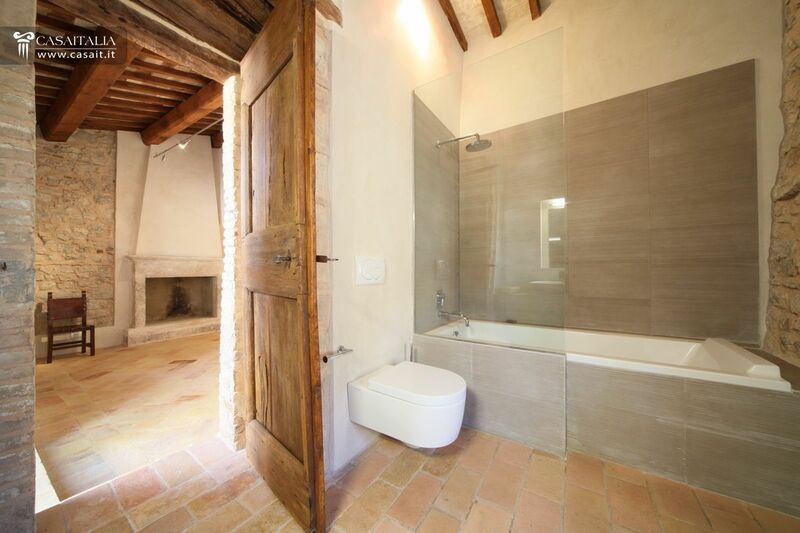 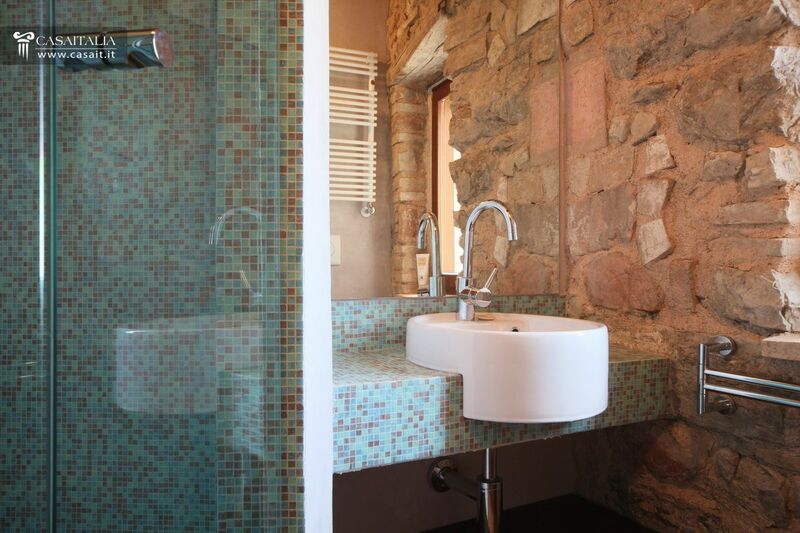 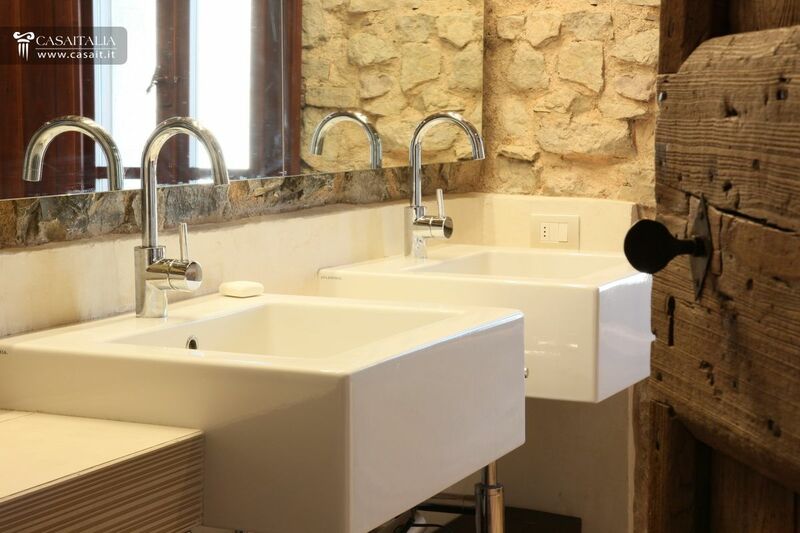 On the second floor there are two bedrooms with private bathrooms, one of which has a Turkish bath. 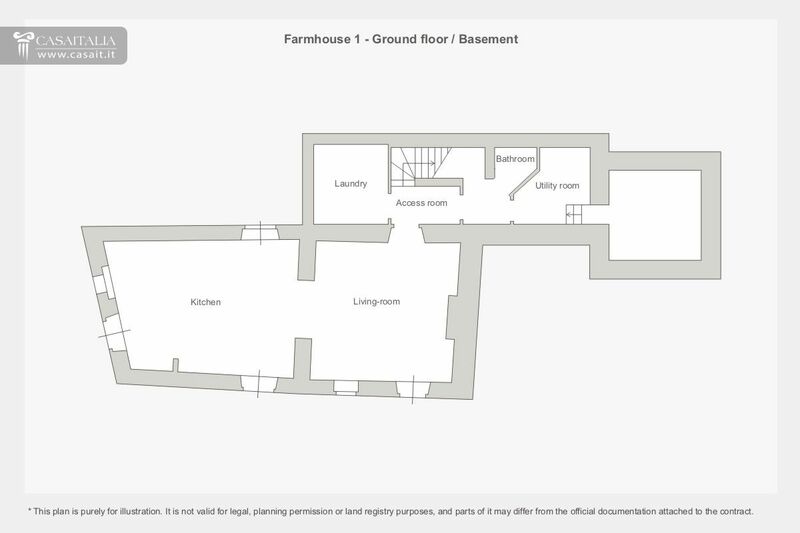 Also set over 3 levels with a surface area of 412 sq.m. 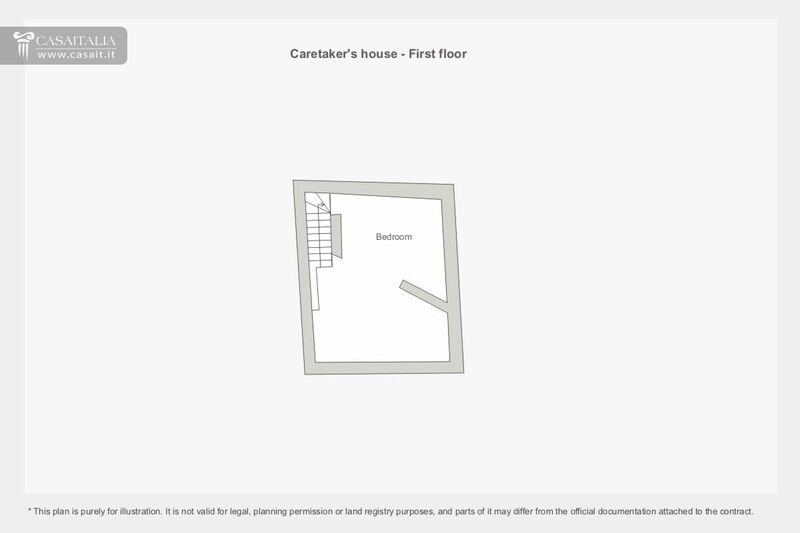 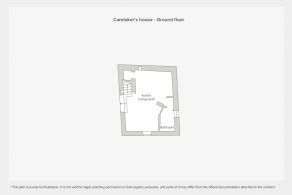 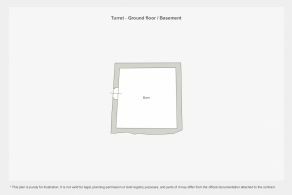 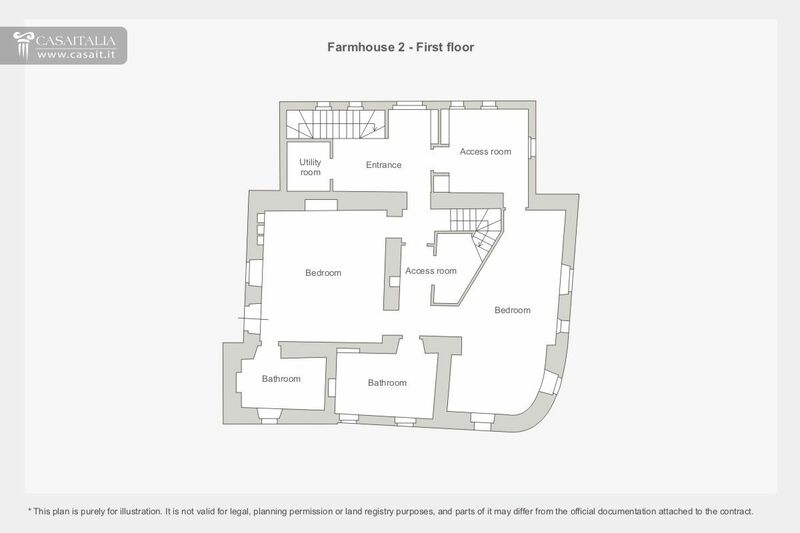 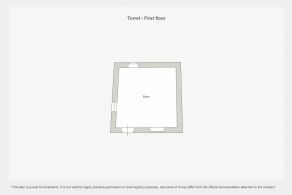 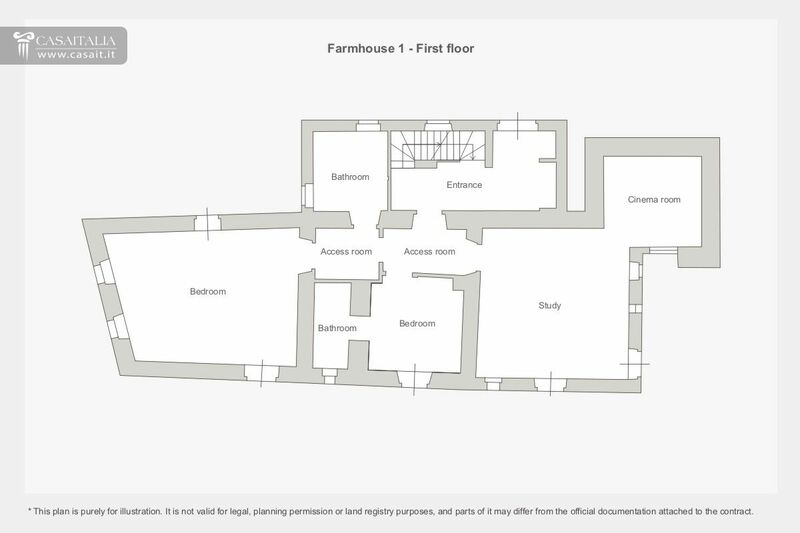 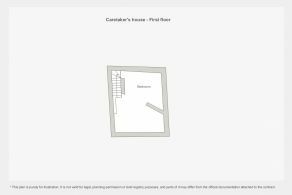 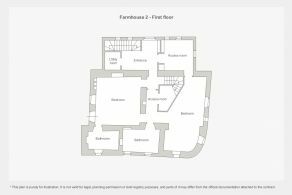 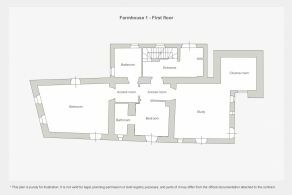 The ground floor/basement comprises the living areas, with the living room, dining room, kitchen, sitting room, bedroom with bathroom, laundry/ironing room, cellar and another bathroom. 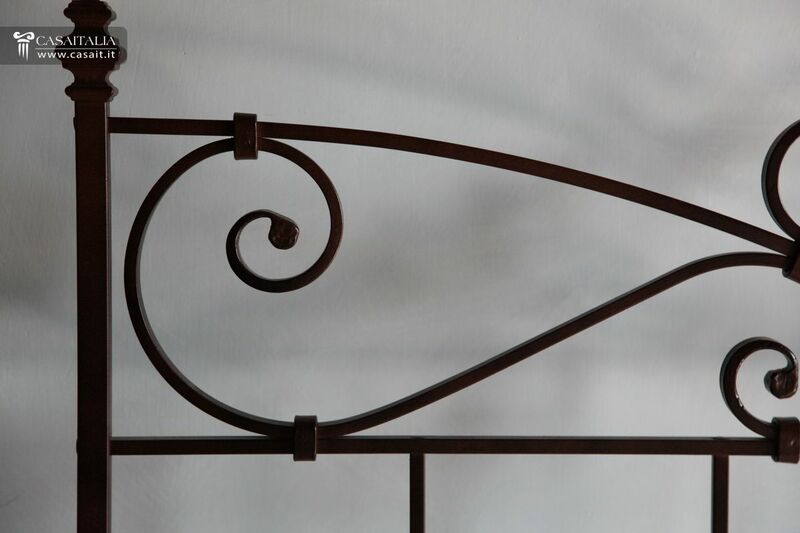 On the second floor, with an entrance direct from the garden, there are the sleeping quarters, with ample hallway and two large bedrooms (each over 25 sq.m) with en-suite bathrooms. 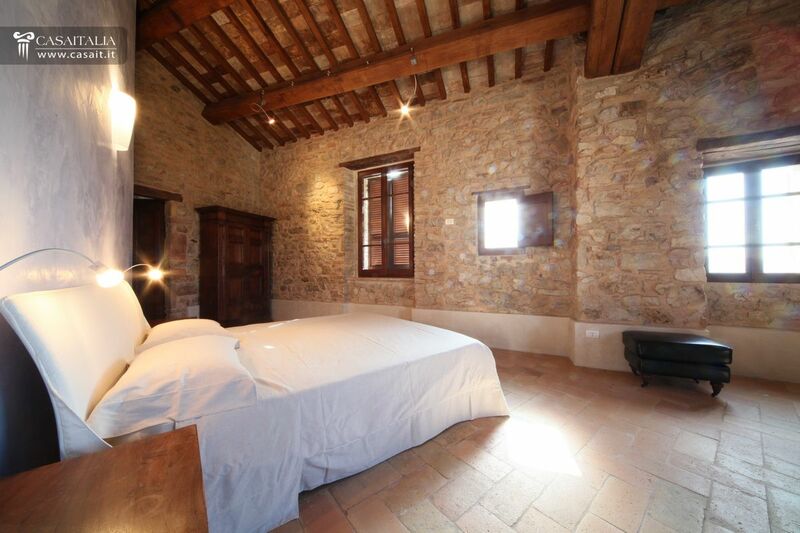 On the top floor there is another large bedroom with a bathroom. 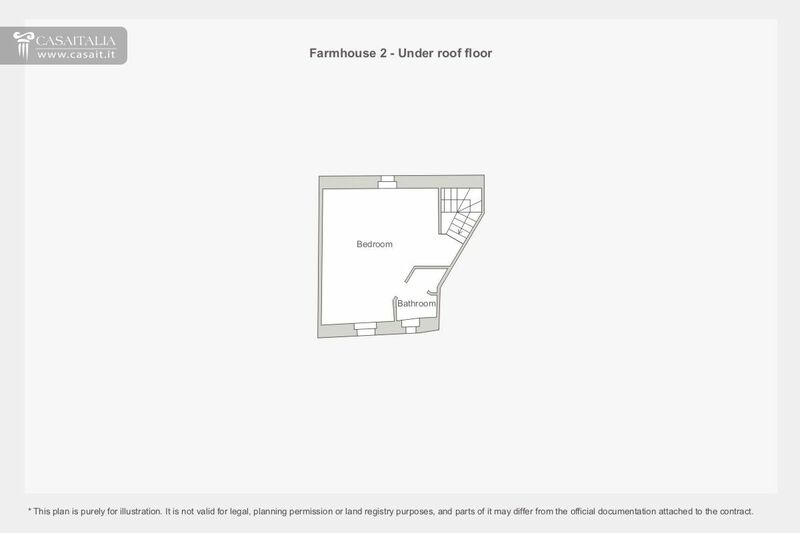 With total surface area of 93 sq.m, over two levels. 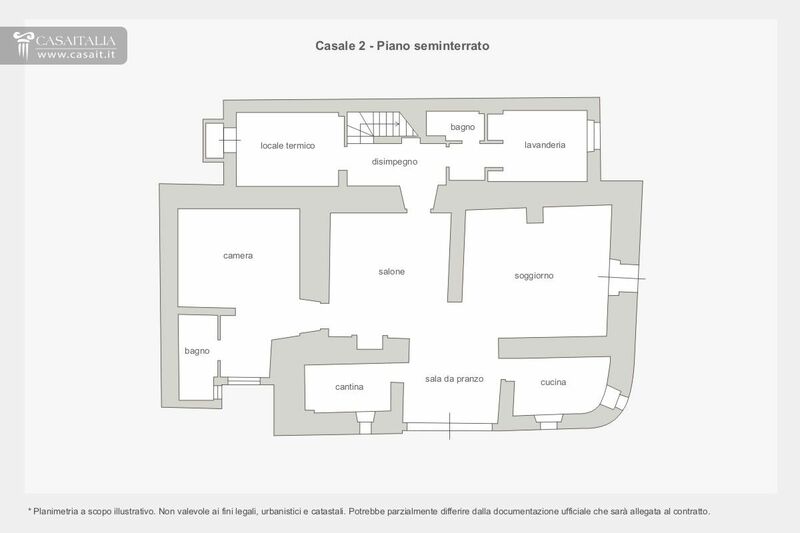 On the ground floor there is the kitchen/living room with a bathroom and on the first floor there is the bedroom. 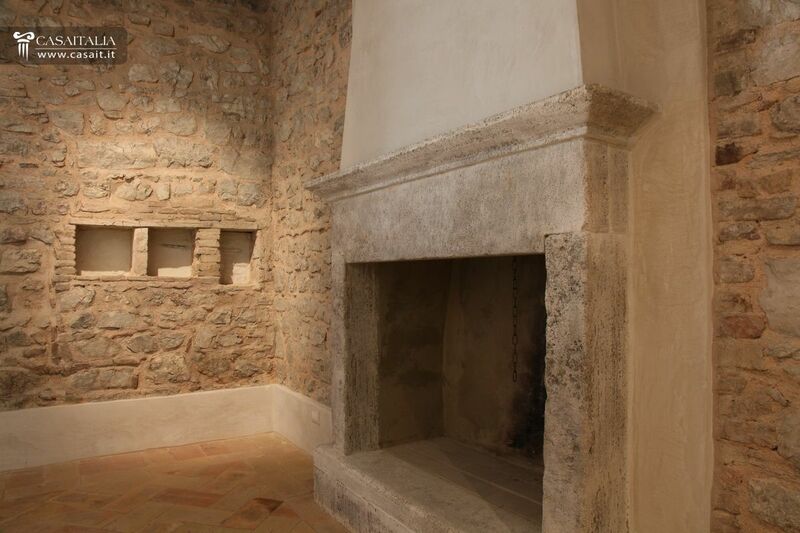 The tower has a total surface area of 94 sq.m, over two levels. 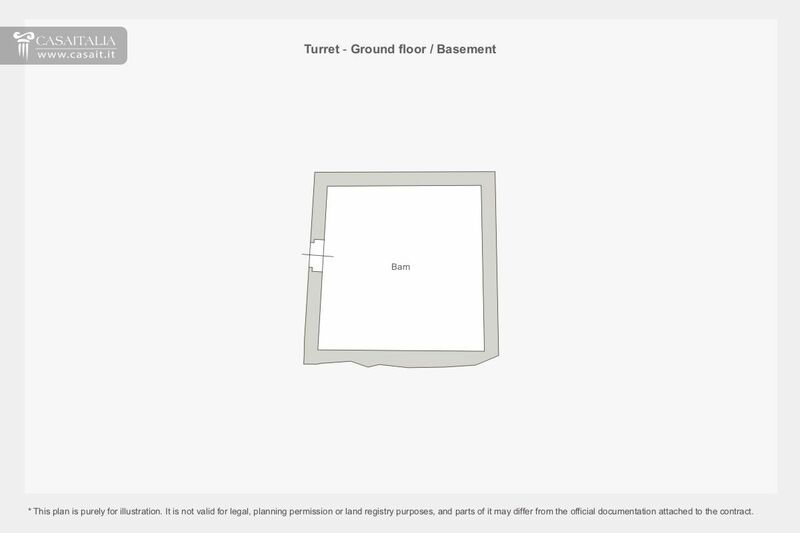 Currently comprises an opening at each level which are not connected internally. 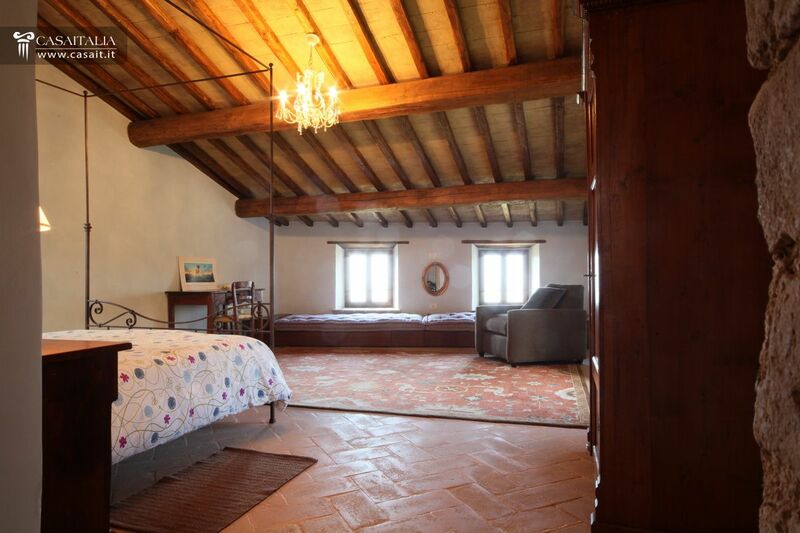 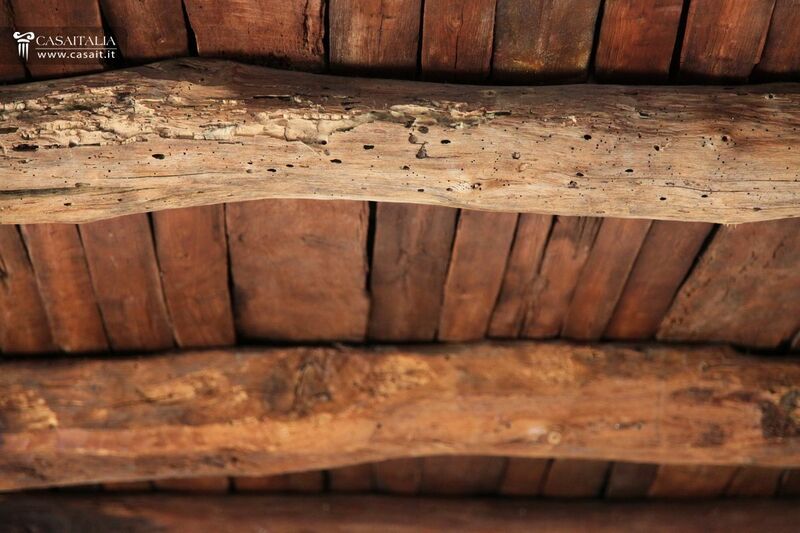 Originally intended as a hayloft, it would be possible to convert it into habitable accommodation. 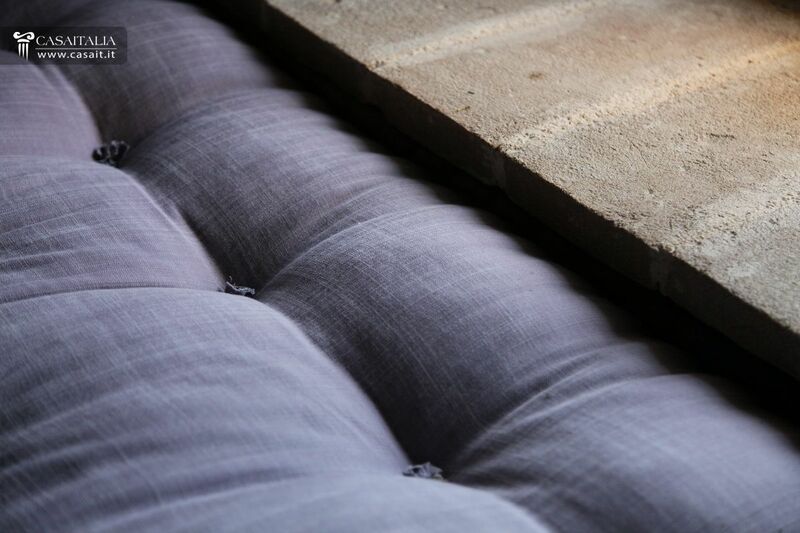 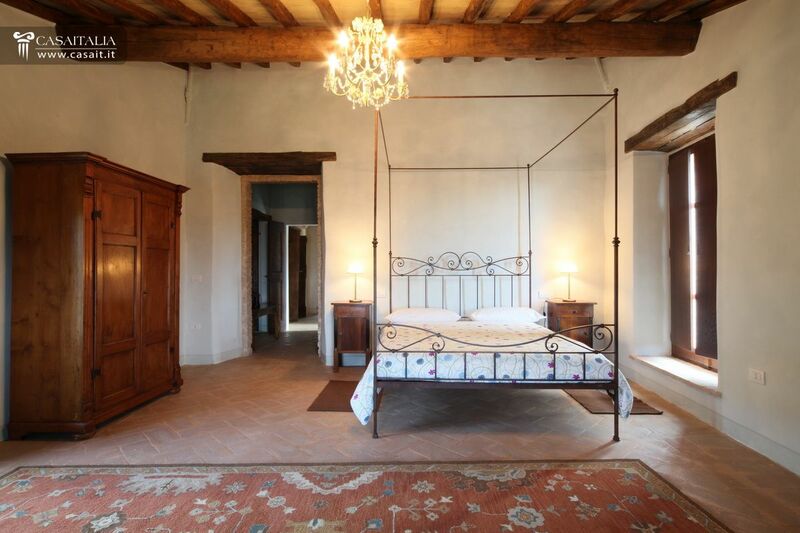 The two farmhouses and caretaker's lodge have been subject to careful restoration which has remained true to the traditional architecture typical of rural Umbrian farmhouses. 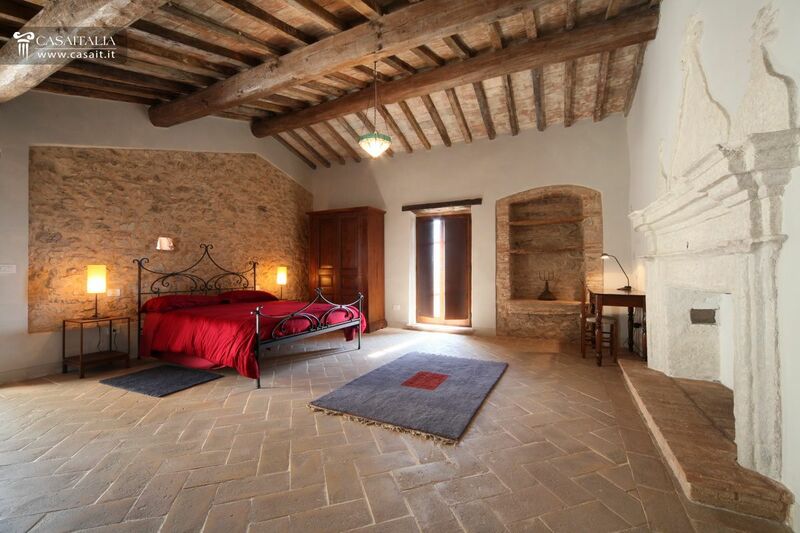 The exteriors are exposed stonework with tiled roofs, while inside there are tiled floors and ceilings with wooden beams and tiles, internal doors and original stone fireplaces. 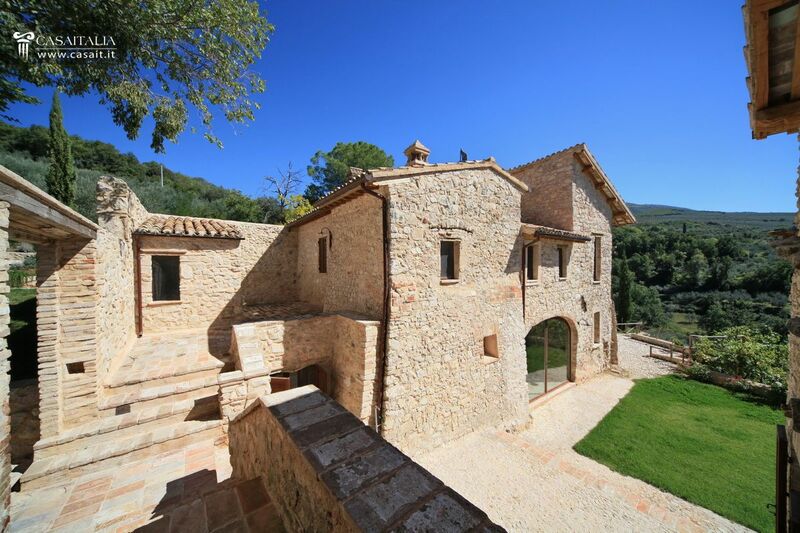 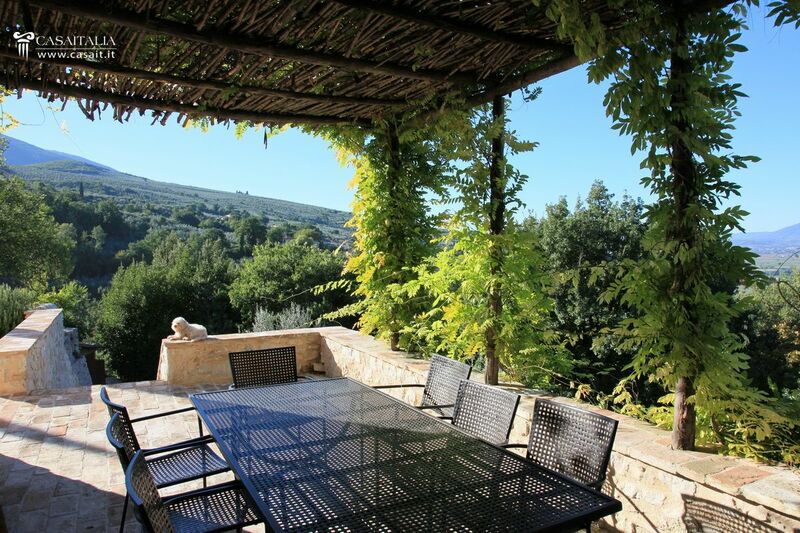 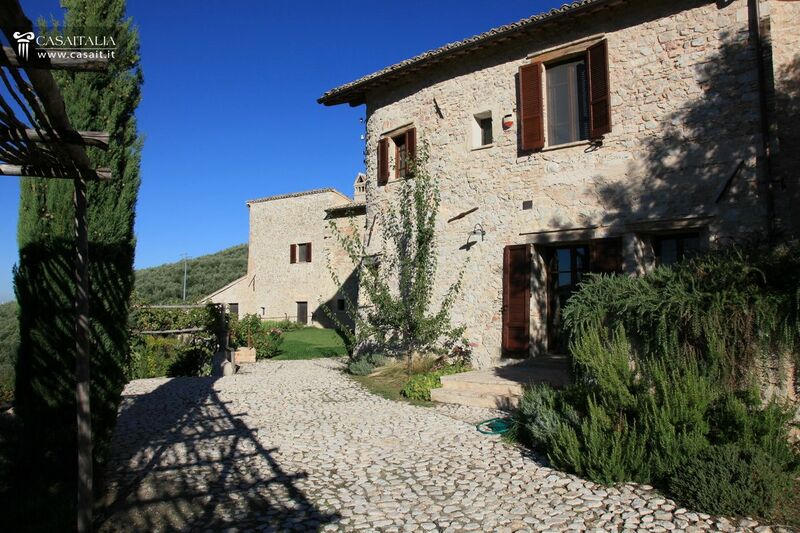 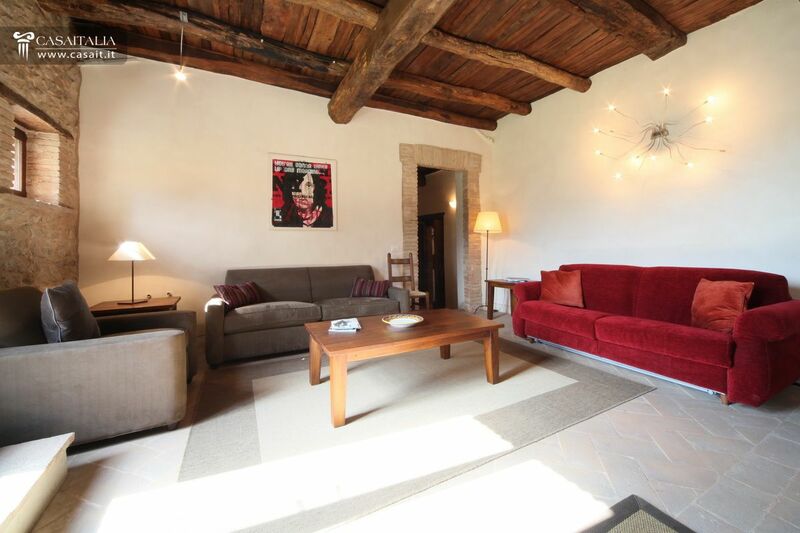 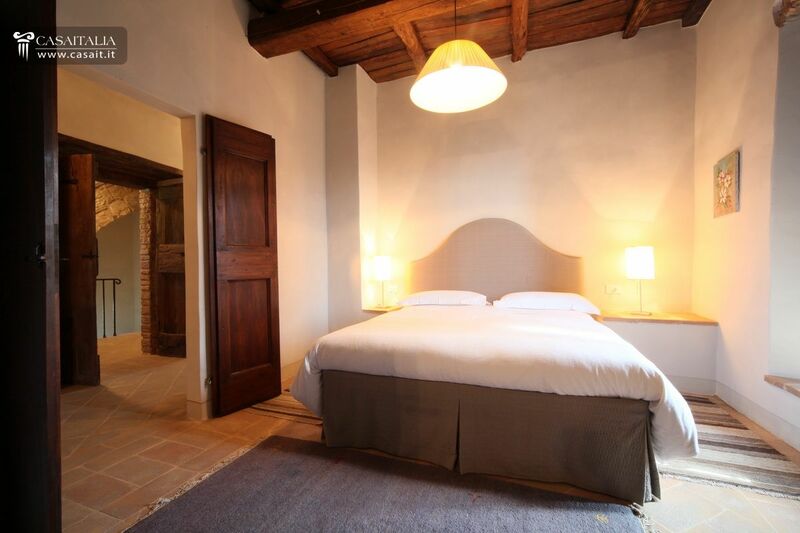 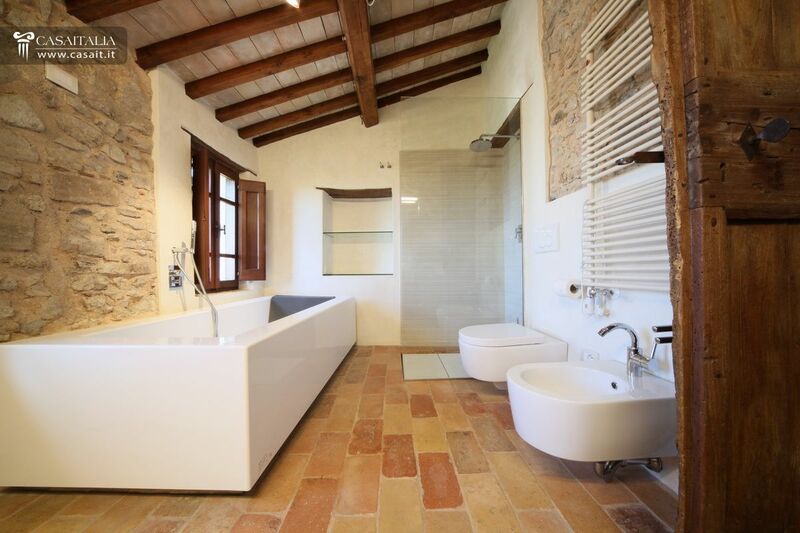 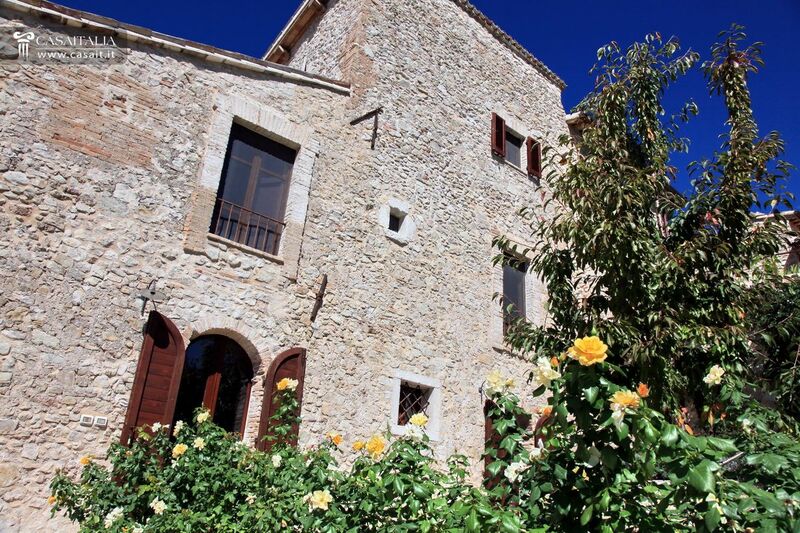 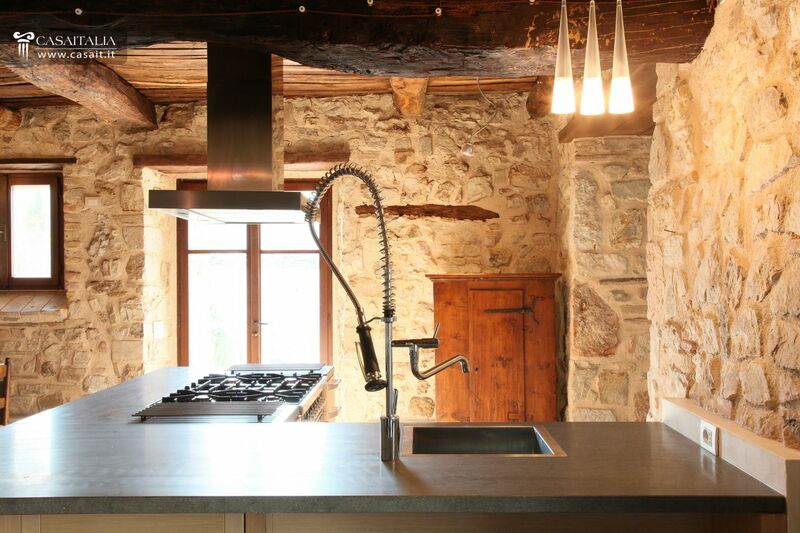 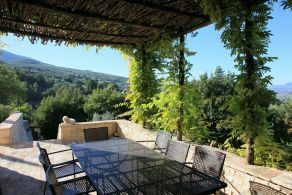 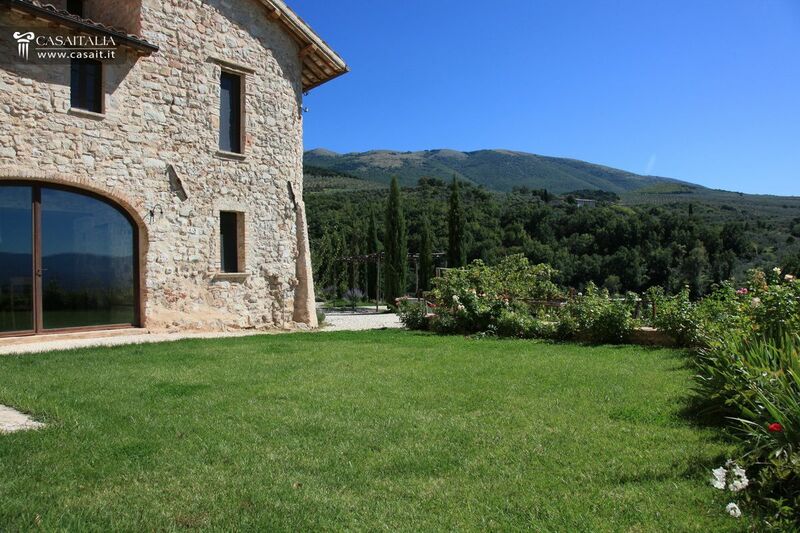 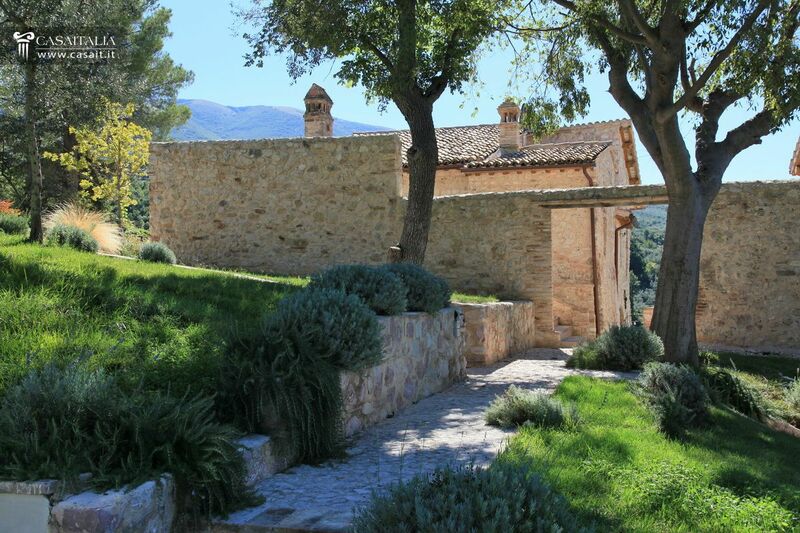 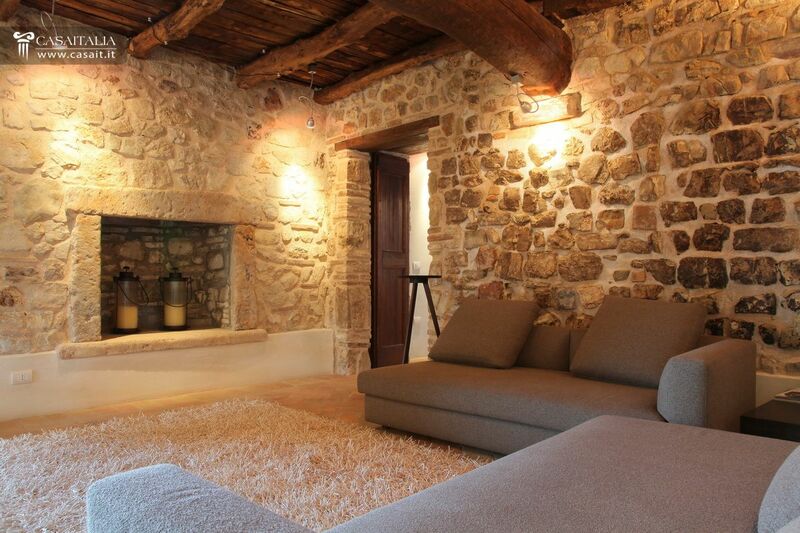 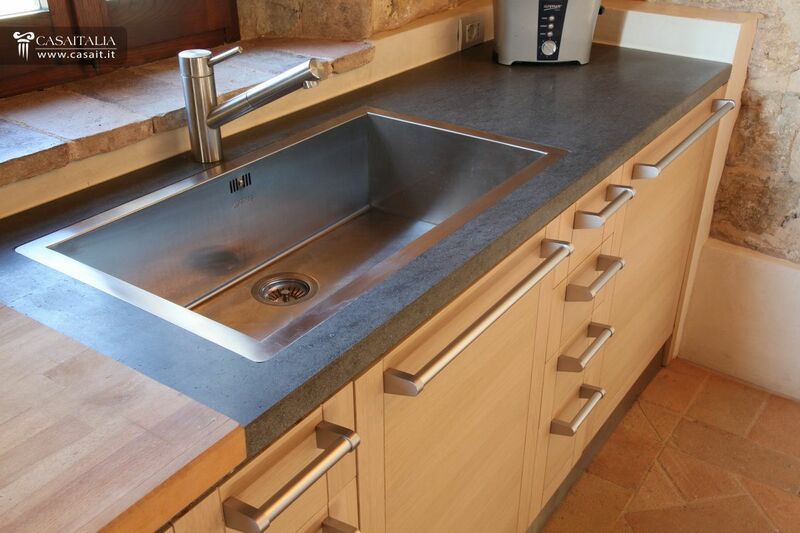 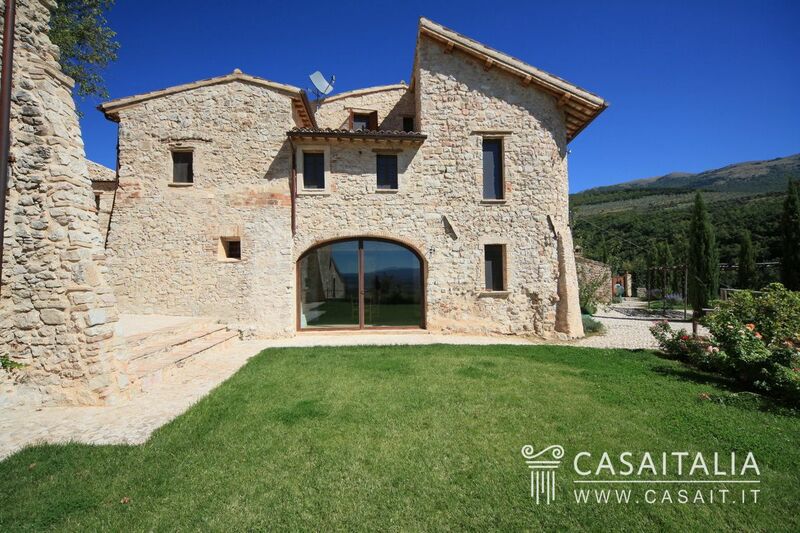 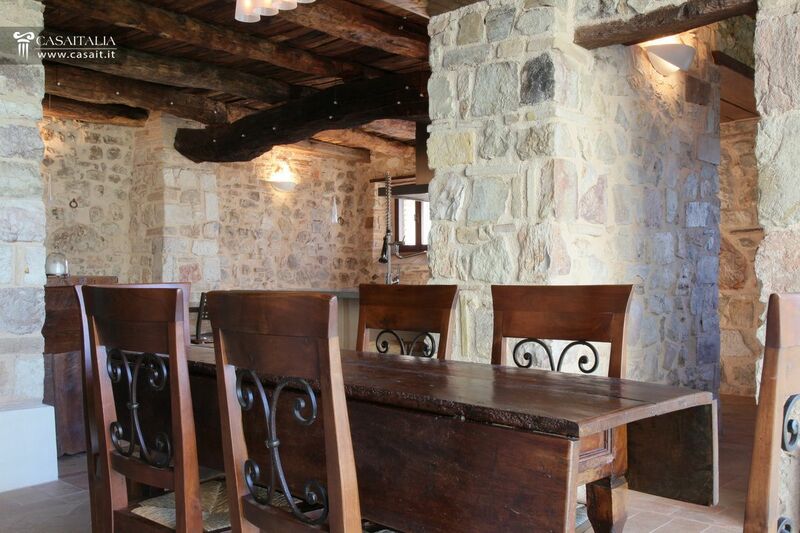 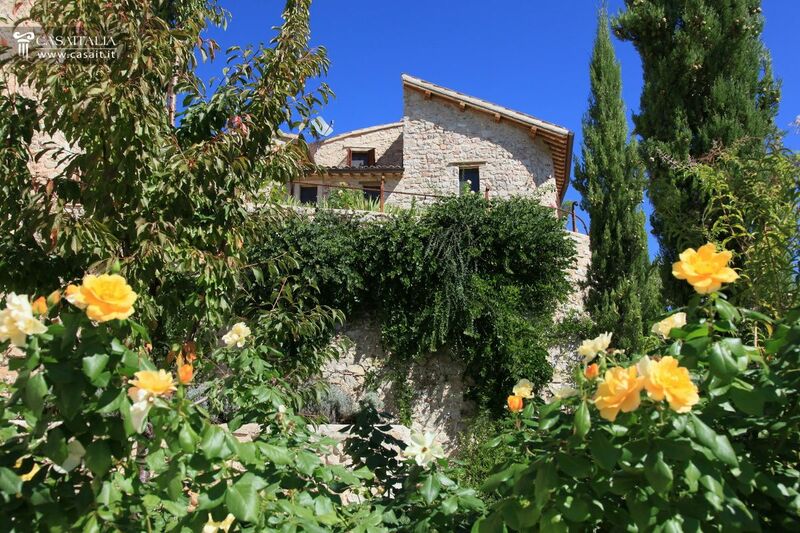 The farmhouses are surrounded by hilly private land of around 1.7 hectares, with olive trees and woodland. 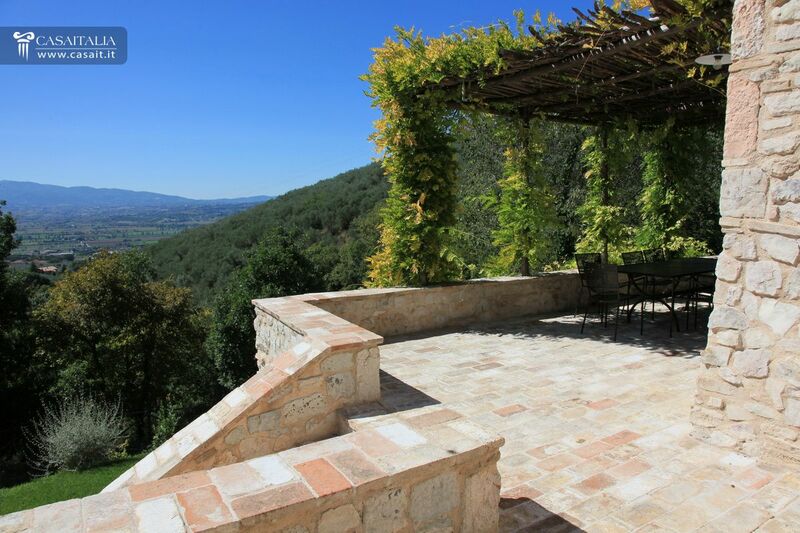 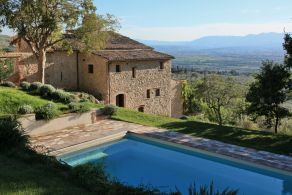 In front of the houses there are panoramic terraces with views over the Spoleto valley as far as Perugia, while the swimming pool can be found at the back. 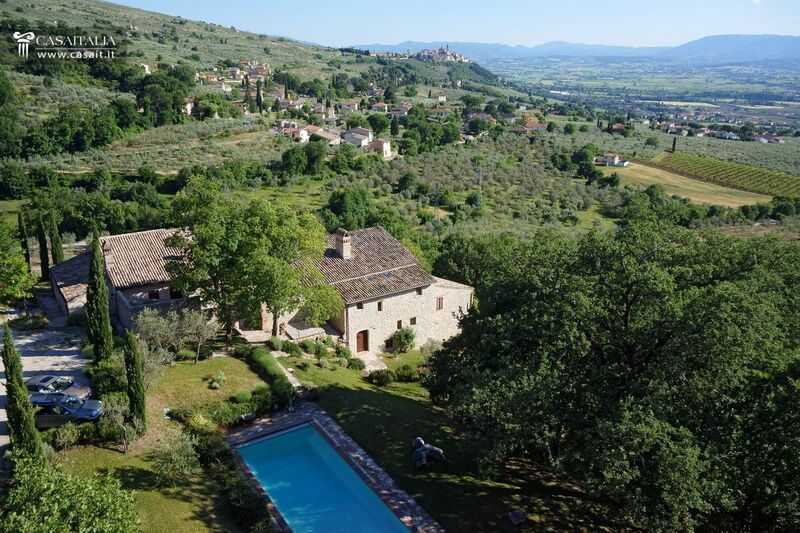 The location of these farmhouses is perfect; secluded but at the same time close to two towns, Trevi (3km) and Foligno (8km), in which there are shops, restaurants and all kinds of services. 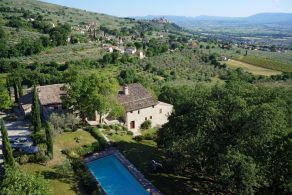 For this reason, the property would be ideal as a main residence, with the possibility of using one house for family and guests, or as a small tourism business such as holiday accommodation thanks to its proximity to the airports in Rome and Perugia.